Starting and finishing in the 'adventure capital' of Queenstown This comprehensive South Island itinerary visits every South Island must see location including Milford Sound, Mt Cook National Park, Christchurch, Abel Tasman National Park and Nelson, and the West Coast Glaciers. Your first stop today should be the visitor centre on the southern shores of Lake Pukaki. As well as a great presentation detailing the formation of the region over thousands of years, you are also often rewarded with uninterrupted views of the peak of Mt. Cook. Lake Tekapo, the northern most of the large Southern Lakes also displays the reflective quality that Pukaki has making the waters a bright turquoise on certain days. This busy little township is home to some of the most photographed subjects in the country, the Church of the Good Shepherd and the Collie Dog statue. It's a great place to take a scenic flight, enjoy a guided horse trek, a boat trip on the pristine lake or just marvel at the magnificent views. From here you descend from the high country through Burkes Pass and into rich farmland. Beautiful Valley guides you to the town of Geraldine. From the rural hub of Geraldine follow the inland scenic route through rural South Canterbury. Along the way, the Curio shop at Mayfield is worth a look if you enjoy antiques and oddities. Further along the way, the café at Stavely is famed for its sausage rolls, great for a refreshment stop. The Rakaia Gorge is spectacular and well worth taking time to stop and enjoy the views on either side of the Rakaia Bridge. Carrying on the scenic route you will pass through tiny villages such as Windwhistle, Glenroy and Glentunnel that guide you towards Darfield, a larger agricultural service centre and then onto the city of Christchurch. The Coastal Pacific train journey travels between Christchurch, the South Island's largest city and the delightful port of Picton. 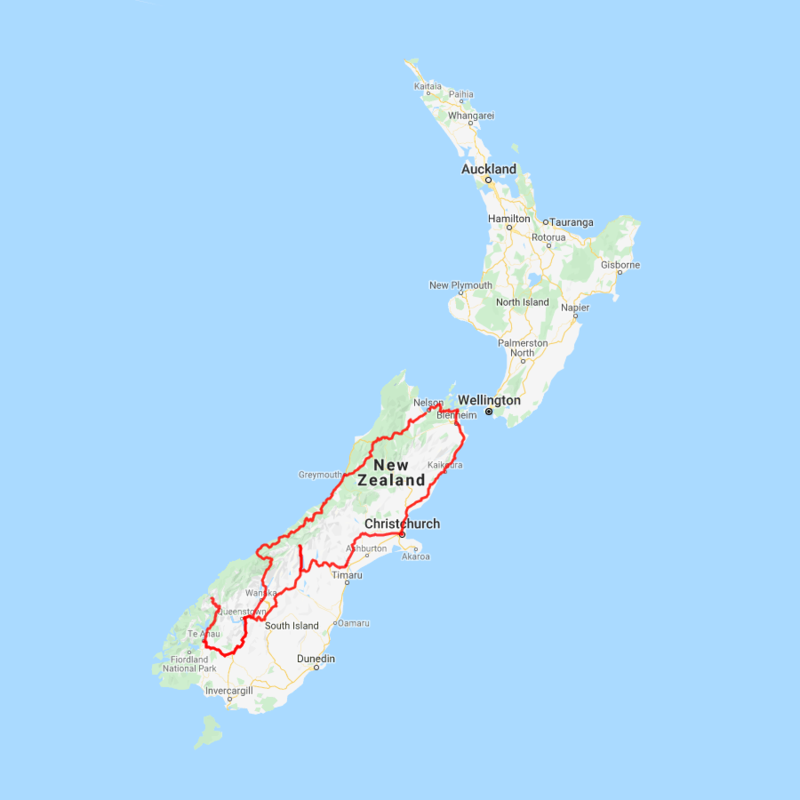 This journey is a scenic feast of New Zealand, with the Kaikoura mountain ranges on one side of your train and the rugged Pacific Ocean coastline on the other. Along the way you pass though the town of Kaikoura world famous for its resident whale population and its whale watching tours. One of the world's most scenic train journeys, the Coastal Pacific travels through 22 tunnels and crosses 175 bridges. As on The TranzAlpine, The Coastal Pacific includes an open air viewing carriage where all your senses are awakened with the clean, fresh, sea air. Nelson City Centre is a vibrant hub of cafes, restaurants, bars and shops. Along the waterfront you’ll find many fine restaurants, specialising in seafood and fresh produce. Its close proximity to Abel Tasman National Park is one of Nelson's great advantages to visitors, and it’s pristine waters, beautiful native bush and golden beaches make this an adventure seeker's paradise. The vibrant Nelson City centre offers an abundance of cafes, restaurants, bars and shops and along the waterfront you will find many fine restaurants specialising in seafood to enjoy. Founded in 1841 by the New Zealand Company the region today still boasts many remarkable buildings from these early days, however it is its close proximity to Abel Tasman National Park that is one of Nelson's greatest advantages to visitors. The pristine waters, beautiful native bush and golden beaches make this an adventure seeker's paradise. Nelson is also famous for its art and crafts and you will find many local offerings - including the world famous Hoglund glass works. Leaving Nelson today pass through the suburb of Richmond before travelling through the Nelson Lakes and Kahurangi park region. Trees, rivers and valleys accompany you as you head towards the town of Murchison - a great place to stop for lunch. Continuing on to Westport, you’ll drive along the Buller Gorge and see some magnificent scenery as you follow the river. Crossing the river you’ll get magnificent views of the gorge, while the other side brings many short bush walks, jet boat rides and historic gold mining remnants. Travel through several small towns including Reefton, the first town in Australasia to have electric lighting, before heading down the West Coast to Greymouth, your destination.